A postcard from Grant in South Australia. Built for Orient Lines in 1928, SS Orford was loaned to France during WW2 as a troop carrier. She ran aground in Marseilles while evacuating troops in 1940. It took seven years for her to be refloated, after which she was scrapped. She made many journeys between Australia and England in the 1930’s. In 1934 she carried Don Bradman’s cricket team “The Invincibles” from Australia to England along with the Australian Davis Cup tennis team. I have an unofficial publication The ORFORD CALENDER with itinerary for the voyage on the 29th Sep 1929 to 2nd Jan 1930 Britain to Australia, table of distances etc. I intend to put it on ebay; I don’t expect it to be a huge money maker but just thought you may be interested. 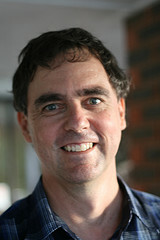 Geoff. Thanks for the info. Hey that’s a great stamp. I might have a look through my albums here and see if I have it. My late father was a steerage passenger on the Orford on it’s maiden voyage from England to Australia, with several other Dreadnought Boys. I have just purchased a photo album of a family cruise aboard the Orford dated august 1931 it has signed menus of passengers and crew. My grandmother cruised on the orford after leaving scotland in 1928 on a work scheme at the age of 25 with a group of young ladies who had to work in Australia for 2 years. Some went back after 2 years of work. My grandmother meet my grandfather who is scottish and then came out to settle in New Zealand. My grandmother, mother and aunt sailed on the Orford in Oct/Nov 1928 from Naples to Melbourne, Australia, to be reunited with my grandfather who had sailed to Aust in 1922. They were very simple and poor family so the luxuriousness of this ship leaves me baffled as to how they afforded it. No assisted passage for them I know. My father was the third Engineer on the Orford in 1938 and met my mother during a cruise of the Med. I have menus and some pictures of their cruise taken on board. 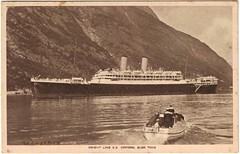 I have a nice postcard image of the S.S. Orford. Again with crew in a boat in the foreground and hilly terrain in back but the bow pointing to the right. 13 at the time,so it must have been a great trip,with so many famous people on board.He never mentioned it,sad! My grandfather, Wilfred Bone, worked on the Orford as an ‘Oiler/Greaser’ from 1937 right up until it was bombed & ran aground in Marseilles harbour on 1st June 1942. He managed to escape the fire by climbing down a rope. Somehow he found his way back through France, across the channel & to his parents house in Chatham Kent arriving there at 3.00am in just his boiler suit & white plimsoles. He had to throw stones up at the bedroom windows to wake the family. My dad (Jack Williams) came out from the UK on the SS Orford as part of the New Settlers Scheme. He came out as a 16yo in 1937/38 we think and disembarked in Brisbane. The route must have been via the Suez as he can remember camel trains along the banks. Are there passenger lists available?? Would love to know more!! My 2x great grandfather took a cruise on the Orford and I have a picture of him in Pompeii in July 1938. Can anyone help work out where the cruise went? I have sword and scabard style paper knife inscribed ss orford. Of any value? Hi Phillip, I am Paul Cross & am also one Wilfred’s grandchildren & I have his MN Discharge book in my possession as grandad gave it to me when he knew I wanted to follow in his & my dads footsteps and also go to sea. It is the one of the only things I have left of my grandparents & I treasure it beyond price as when my grandmother died one of the family gutted the house before anyone could get there and it caused a lot of upset. I was away at sea at the time & the first I knew was when I got back to the uk. My Dad William A Hall was a crew member of the Orford for 4 years. He must have known Wilfred. He joined Orford as a deck boy aged 14 in 1936 and was a crew member until she sank off Marseille when he was mentioned in the details as a minor, just 17. He was sunk 6 more times during the war but amazingly survived the war including convoy PQ 18 although I would not say totally unscathed.